So far we have seen how vocabulary, fluency, and phonics can impede comprehension. Now we are going to take a look at the inside thinking that happens. This is the metocognitive side of reading. Children need to be taught how to think about reading when they are reading. In other words they need to be thinking about their thinking. Sometimes when a child is reading he/she ends up thinking about something else they are about to do, other than what they are engaged in. Or, a child is working so hard at figuring out the words, that there is literally no extra space available to think about his/her reading. Therefore, if we utilize some of the comprehension strategies when reading with our child, we will be able to guide them in how to know if he/she is understanding what is being read or if he/she is not understanding. One of those strategies is summarizing. If a reader is understanding what is being read, then he/she is able to repeat what was read in his/her own words. A summary is just a couple of sentences about what was read verses a retell. A retell is when the reader tells you everything that they read. Sometimes in the beginning a reader needs guidance in this area. 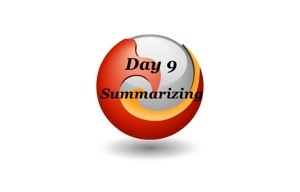 You can begin by summarizing your page and then having him/her summarize his/her page. Once your child becomes comfortable with this process you can have him/her summaraize at the end of the chapter. If the child is able to summarize it shows the he/she is capable of storing the information he/she has read in his/her short term memory. This is extremely necessary in order to do a much more difficult comprehension strategy called synthesizing. As a parent it is not important to hit every single comprehension strategy that is out there. However, practice with some of the basic ones will prepare him/her for the higher level ones they will need to be able to implement as they move up in grade levels. So, practice summarizing with your child, talking about the book that you are reading, and increase vocabulary by picking out one vocabulary word a day to focus on. Until next time, keep reading! She said we didn’t see you doing any tricks now go and put away the hose and the wheelbarrow and sweep up that broken glass dinner will be ready in about five minutes and it’s your favorite. Now read the paragraph again, but this time with the correct punctuation in place. She said, “We didn’t see you doing any tricks. Now go and put away the hose and the wheelbarrow and sweep up that broken glass. Dinner will be ready in about five minutes and it’s your favorite. Did you notice the difference in how you understood that one paragraph with inserting the correct punctuation? I have found that no matter how many times you tell a child to stop at a period and pause at a comma, that it doesn’t really sink in for them. 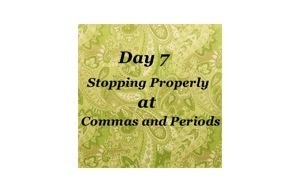 So, here is what I do to make the period and the comma become real living things. I have the child knock twice at the period and knock once at the comma. Since I do all of my tutoring online, I am actually able to introduce this idea by drawing on the commas and periods. I will physically put two backslashes on the periods and one on the comma so that it pops out at them a little bit more. When the child forgets to stop or pause correctly after we have worked with this method for awhile we are able to simply go back to the “Try again” model. We ask them to try the sentence again or try the paragraph again. You will be amazed at how much more information your child is able to retain as soon as you begin implementing this method. It is amazing. Here is to fluency and here is to comprehension! Keep reading.